appears to be through letters to the editor! 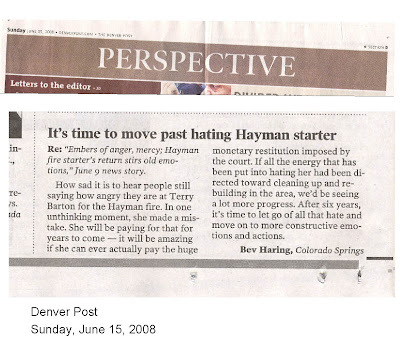 Early last week the Denver paper ran an article about the people that live in an area that has been called The Hayman Fire -- a massive fire that happened 6 years ago and was accidently set by a woman that was burning a distressing letter from her husband. I was so struck by the hate that seemed to flow out of the page that I wrote a letter to the editor about it. Mid week I got a call from the editor's office to get my permission to print it. It will be interesting to watch the on-line forum to see if there are any responses to it. Have you had any feedback concerning your letter yet?